When I was 24, I was broke and living on my sister’s couch after a career-ending football injury. My dream of being a pro-football player was done. I had no work experience and a pile of mounting credit card debt. My arm was in a huge cast that was really uncomfortable (for six long months). I was feeling low. At Christmas that year, my brother Chris gave me a book that had just come out: The 4-Hour Workweek by Tim Ferriss. I wasn’t a big reader (having struggled in school my whole life with dyslexia), but I finished that book in a few days. My fire was lit. Fast forward a few years, and I found myself running my own business, making millions of dollars in sales, living a dream lifestyle, and playing sports again. I even wrote a book that got picked up by a major publisher for a nice advance, and I’ve got my sights set on the New York Times bestsellers list. It did not happen overnight, and it did not happen on my own. But it’s absolutely possible to do if you focus, hustle, and take notes from the best in the business. 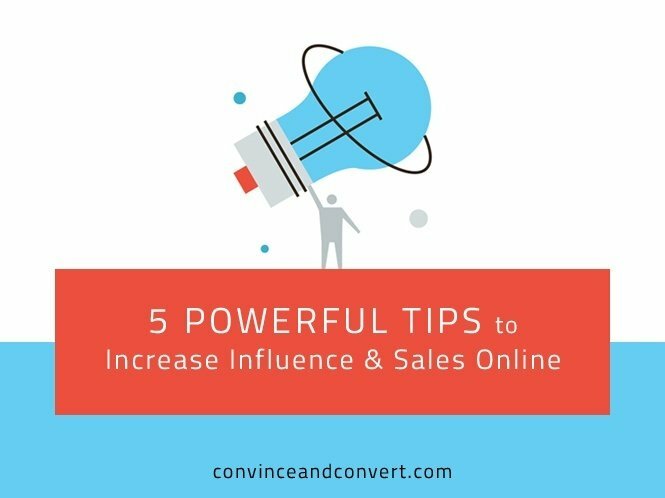 Here are my top five tips to make a powerful shift in your online sales and create an influence that opens doors. Mentor relationships are everything, especially when you are trying to get to the next level. Identify a few A players in your niche who are where you want to be, and figure out how you can support their goals. Think creatively about this. It can be offering connections, your services, your expertise, doing grunt work for them, or anything simple that is hard for them but easy for you. Give, give, give, and you’ll receive plenty in return without asking. This may seem like a big out-of-pocket expense, but it’s worth it. In the digital age, people make snap judgments about a brand based on what they see. It pays to get professional-quality work done on your website, logo, and photos. Don’t skimp here. People ask me all the time who designed my site and who takes my lifestyle photos. I’ve spent top dollar on both, but that’s the kind of feedback that lets me know I’m doing it right. No, you do not have to be on every social platform. Just pick a few that you really like, and use your authentic voice to share on these. Consistency is huge, as well as quality. Also, keep up with the new platforms and try them out. These are less crowded, and it’s easier to get a large following quickly because you stand out. I’ve recently been on Periscope several times a week, and it’s been amazing to see how quickly people join my sessions and interact with me. I’ve been able to sell lots of books on there as well. I’ve been a fan of webinars since the first one I ever presented on in 2009 (and made $6200 without having a product ready—I thought I was rich). These are hands down the most powerful way to sell to a large audience in a powerful, direct way. They are very time efficient, and you get to capitalize on the energy of a live event. Once you learn the power of webinars to sell, you’ll never go back. The next step is to automate them and use Facebook ads to funnel targeted customers—a game changer for my business. No, really—do it for your brand if nothing else. As soon as you write a book, you not only can call yourself an author (or a bestselling author), but you are seen as an expert in a niche. I’ve been working on my new book, The School of Greatness, for years, and it’s finally here. I took the lessons I’ve learned from my podcast guests and consolidated them into eight key principles. My whole brand is now captured in a book, which has allowed me to get press and introductions that weren’t open before. It’s the perfect tool to share what has led me to this point and to launch me to the next level. You can push yourself and your business to the next level, but you can’t do it alone, and you certainly can’t do it without developing relationships, working hard, and using the best platforms to share your ideas. Lewis Howes is a lifestyle entrepreneur, high performance business coach, author and keynote speaker. A former professional football player and two-sport All-American, he is a current USA Men's National Handball Team athlete. Lewis hosts The School of Greatness podcast, which has received millions of downloads since it launched in 2013. His newest book, The School of Greatness, provides a framework for achieving real, sustainable, repeatable success. Lewis was recognized by The White House and President Obama as one of the top 100 entrepreneurs in the country under 30. He is a contributing writer for Entrepreneur and Yahoo Health and has been featured in The New York Times, Forbes, Men's Health, The Today Show and other major media outlets.